Protect your investment.Made In Minnesota USA.This metal steel fire pit ring liner is made for use as a liner to protect your block brick stone from drying out,cracking and then falling apart. 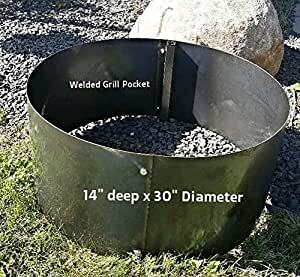 14″ deep x 30″ Diameter with a welded swivel grill tube. We use a square tube because a round pipe will turn better.Made from 14 gauge steel. We do not paint the liners.Paint will burn off.You can see more of our products by typing Higley Fire Pits In The Amazon Search Bar.